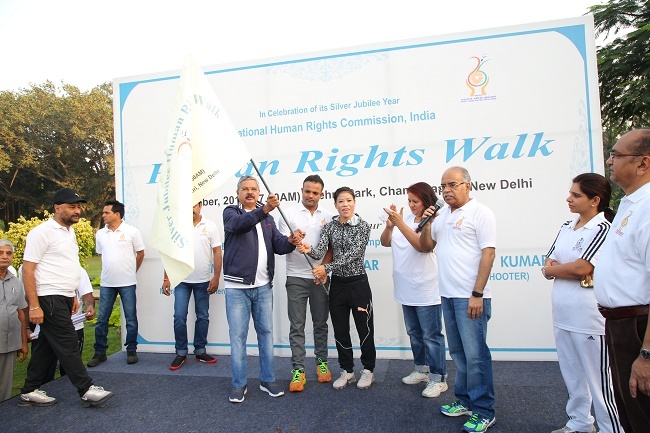 The three day-long extended celebrations of the silver jubilee of the National Human Rights Commission concluded with the ‘Human Rights walk’ at Nehru Park in New Delhi on the 14th October, 2018. It was flagged off by NHRC Chairperson, Mr. Justice H. L. Dattu, and celebrated sportspersons, Ms. J. Mary Kom, boxer and Mr. Vijay Kumar, shooter. both Olympic medal winners. Scores of people, including women and children, representing different sections of the society, participated in the walk organized by the Commission to build awareness on human rights and seek people’s commitment to promote and protect them. 'Live and let live' ethos is an embodiment of a sportsman’s spirit, which is imbibed in Indian culture. That is why, the Secretary General, Mr. Ambuj Sharma, in his brief address before the start of the Human Rights Walk, said that the Commission was thankful to both the leading sportspersons of the country for their participation in this event, which was also meant to send across a symbolic message of brotherhood and peace. Mrs. Jyotika Kalra, Member, NHRC and other senior officers also participated in the walk.